September is all about the Three Musketeers. There have been numerous movies made from Alexandre Dumas’ classic adventure stories. The Musketeers are some of France’s most beloved characters, and their story is a bit of comedy, a bit of romance, a bit of political intrigue, and a ton of action all rolled into one. Personally, I love these characters and their stories. You can choose any of the many Three Musketeers films. Some are better than others, and I suppose that depends on your personal tastes, so choose one that you think you’ll enjoy. No matter what you choose, you’re sure to learn a ton about French history, as well as one of their most famous literary icons – Alexandre Dumas. There was a version of the Three Musketeers made in 2011. Critics didn’t seem to like it much, and it doesn’t follow the original book too closely, but if you’re a fan of modern movie making styles, this may be the one for you. One of Mr. Doerr’s favorite movies is the 1993 version of The Three Musketeers. Made by Disney, it’s a family friendly story that sticks fairly close to the novel. The music is great, and the action scenes are pretty fun, but some of the big stars of the ’90s that they cast in the movie aren’t the best actors. All in all, it’s a good version. 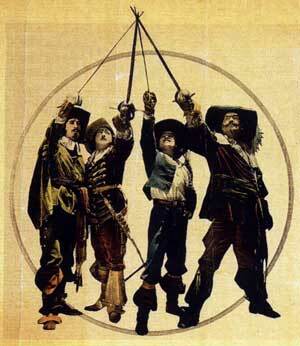 Way back in 1973, Hollywood made a version of The Three Musketeers that was a big hit, and that critics thought was very good. It’s probably the best of the bunch at sticking to the novel, but it was made in the ’70s, so it’s a different style than today’s faster paced, bigger budget movies. It’s a good one, but might not be for everyone. This one is Mr. Curtis’ favorite of the Musketeer adaptations. If you want to watch a Dumas story, but The Three Musketeers, you could try The Man in the Iron Mask or The Count of Monte Cristo instead. Both are good movies, and pretty fair adaptations of the novels they’re based off of. I’d recommend any of them. If you’d prefer, watch some documentaries and/or YouTube videos about the Three Musketeers, the time period the story was set in, Alexandre Dumas’ and his stories, or anything else related to this topic. I chose to watch the 1993 version by Disney. The movie was very entertaining with great action scenes and some of the greatest lines in movies ever. Porthos was definitely my favorite character, being a silly, but daring character. My least favorite character was the guy who was always yelling at Dartunian. I can’t remember his name though. He was my least favorite because he was super annoying. Especially with that high pitched voice. I learned that France has a very colorful backstory. With those who are serious, those who are not, and those who are in the middle (I’m referencing Porthos). I also learned how devoted the people of France were to their king. There are those who are willing to die, and those who take a step over, which I can’t really explain. I chose to watch the 1973 version of the movie. I greatly enjoyed the movie. I really liked all the sword fights and the movie had some great laughs. I liked how there were all different kinds of characters in the story, from the wise dad to the crazy old husband of Constance. I liked Christopher Lee’s performance as Rochefort as well. Overall I think the movie was very interesting and definitely had some similarities to another great movie: Monty Python and the Holy Grail although that was made after this. I learned some more of the historical background between France and England at the time the movie takes place. It also showed me how much backstabbing and political intrigue was involved in the French monarchy. The film showed me some of the historical culture of France that still has some effect today, which will help me better appreciate France. I watched the 1993 Disney version of “The three Musketeers.” I liked the action scenes, especially the final fight to save the king. I leaved that the musketeers was an actual military group in France that protected the king. The true name was the musketeers of the Guard or the King’s musketeers. My favorite character was D’Artagnan. He wanted to be a musketeers because his father was one. For our trip, I can learn how big religion played in European history. It seems like Cardnals have a lot of power during this period. I watched The Man in the Iron Mask for my September movie of the month. I thought the movie was very interesting had a powerful central message, or theme. I liked it so much because it was very appealing to younger audiences, because of the action-packed fighting scenes. I also liked how this movie wasn’t too confusing. Many movies of this kind can be very hard to follow, but this one was not as tough. I especially liked how each and every character was different and individual. This movie will prepare me for our 2016 trip to France by teaching me about how everyone won’t be the same. Some folks will be very outgoing, and others will completely keep to themselves. This is useful knowledge for anywhere you go simply because it’s a life lesson. No two people you meet will be the same, we should all keep this in mind. I watched The Man in the Iron Mask for my September movie of the month. I thought the movie was very interesting and had a great central message, or theme. I liked it so much because it was appealing, especially to younger audiences, because of the action-packed fighting scenes. I also liked how this movie wasn’t too confusing. Many movies of this kind can be very hard to follow, but this one wasn’t as tough. I really liked how each and every character was different and unique as individuals. Tie movie will prepare me for our 2016 trip to France by teaching me about how everyone I meet wont be the same. Some folks will be very outgoing, and others will completely keep to themselves. This is useful knowledge for anywhere you go simply because its a life lesson. No two people you come across will be the same, we should all keep this in mind as travelers. I watched the 2011 Three Musketeers version. It wasn’t the best movie but it had lots of action. It was a little more sci-fi and didn’t really fit with the era. There were air ships that made the movie too far-fetched. I liked how all the characters had different personalities and worked well together, “All for one and one for all.” I didn’t like the king, I thought his character was too weak. I would hope the King of France would be a stronger leader, even if he was a young king. I liked the setting with the buildings and architecture. I really like how they portrayed old France. I would like to see if any parts of France have changed. I did like the back story of who the Musketeers were and how they had to protect the King. Even though this version of the Three Musketeers was far-fetched, the Musketeers really did exist and I am hoping to see places where some fighting took place. I watched the version of The Three Musketeers made in 1993 by Disney. I really liked the movie because it was filled with action and humor. I loved the storyline and how things turned out in the end. It was entertaining with all the side conflicts and romances. Each adventure led to another. The characters showed so much bravery and courage to win back the titleship of Musketeers and to once again protect the king. I loved D’Artagnan and how his will to become a Musketeer never faded even if it meant being an outcast and even after being held prisoner. It is an inspiring story that illustrates some French history in a different perspective. It was also interesting to see the culture and what life was like during that era in France, to see how the country’s past shaped it as a nation. It was very interesting to see what the city of Paris was like back then, as that’s the main location the movie took place in. I love watching movies that take place in another era because I find it very interesting to learn about how people lived at different times in the world’s history. I especially enjoyed the era that The Three Musketeers took place in. I learned a lot to help prepare me for the trip, especially all of the history portrayed in the movie. It is a classic French story which makes it very interesting to learn the story that’s beloved by many in France. I also learned a lot about bravery and sacrifice which portrayed how passionate the French were about protecting their country. This will give me a new perspective for when we travel, as we learn more and more about the French culture and history. The movie also gave insight to how religion played a factor in the lives of those back then. For some, like Aramis, it was very important and played a factor in many of his decisions. It was also shown with how the cardinal played a great role assisting the king back then as well, although he was not such a good person in the movie. Overall I really enjoyed the story of The Three Musketeers and learned a lot about French history and a French classic. After reading these posts I realized that no matter what version we saw the theme was pretty much the same. The Musketeers were brave fighters and they protected their King no matter what and that Cardinal Richelieu was mad for power. I watched the 1993 Disney version which I greatly enjoyed. The movie had the right amount of comedy, action, and romance. I loved all the action scenes like when the Musketeers were saving the King and the Queen from the Cardinal. The comedy was what made the movie great also. I can’t remember the guy’s name but he was always chasing after D’Artagnan to save his sister’s honor and he always showed up at the oddest moments. I loved the way D’Artagnan never lost hope in the Musketeers. When Athos told him the Musketeers were over, he kept trying to get them to change his mind. I learned that in that time period, religion ruled over everything. Especially when Aramis constantly prayed after he killed someone in a fight or in general. I also learned that the Cardinal had a huge influence with the Royal Family. I feel like some of the thing’s Cardinal Richelieu said in the movie that were rumors like; teaching pigs to dance, horses to fly, and seducing the Queen in her chambers were what some Cardinals were accused of, unless that’s just me over thinking things. I learned that the Musketeers took their job of protecting the Royals very seriously. Even though the Musketeers were done, Athos, Porthos, and Aramis still resected the King and protected him. It just shows how much bravery and sacrifice the French would be willing to lose for their country. Most men back then were very honorable about their honor. If someone insulted them or was rude to them it was a dual to the death. I greatly enjoyed this movie would definitely recommend this movie to anybody willing to watch it. I watched The Man In The Iron Mask, starring Leonardo DiCaprio. I enjoyed this movie as it was entertaining and it was easy to follow. In the movie, Leonardo DiCaprio plays the king of France. All he cares about is himself, staying in power and women. He treats his people very poorly, even his own mother lives in fear of his wrath. He will do anything to stay in power so when he discovers he has an identical twin brother he locks him in a tower and puts him in an iron mask to hide his identity. As the movie goes on a group of the best musketeers set up a plan to overthrow the king and replace the king with his brother. All of the characters have very different personalities but manage to get along and work together to stage the uprising against the king. The characters fight side by side and want the very best for each other…”all for one and one for all!” The Man In The Iron Mask will help prepare me for the trip because it showed me more about France’s history and their legendary musketeers. I would highly recommend this movie to anyone who wants a good story about the French Musketeers.